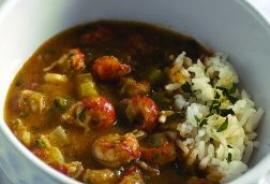 This recipe was featured in Louisiana Cookin' magazine and is from Tricia "Teedy" Boutté. She is a fabulous cook and a soulful singer! In a heavy skillet or Dutch oven, melt the butter and then stir in the flour. Cook and stir constantly over low heat for about 20 minutes, until mixture is a caramel-colored paste. Add the celery, pepper, and onions; stir until coated. Add the broth, water, parsley, tomato paste, bay leaf, salt, pepper, garlic powder, Creole seasoning, and cayenne. Stir the pot well to make sure that the roux is well incorporated and there are no lumps. Bring to a boil. Reduce heat to low, cover, and simmer for 30 minutes, stirring occasionally. Remove and discard the bay leaf. Add crawfish and heat through. Recipe and photo courtesy of Louisiana Seafood and Marketing Board.